on the transformation of precious materials. With more than 15 years experience in his field, Robert Langlois has been able to stand out in Québec as well as in other countries. Appreciated for his subtle and nuanced approach, his original creations in gold, silver, with fine and precious stones, and pearls have charmed hundreds of people. After participating for several years in various shows and expositions, he chose to have a storefront in the very nice “Quartier des Créations de Québec”. Here, he showcases the strength of his team. The Robert Langlois’s Workshop-Boutique, is located in the heart of the Old Port, on one of Quebec City’s most beautiful streets, rue St-Paul. Surrounded by multiple shops, galleries and restaurants, the Robert Langlois’s Workshop-Boutique offers you the chance to experience the conception and creation of a piece of jewelry due to the open space concept always available to the public. 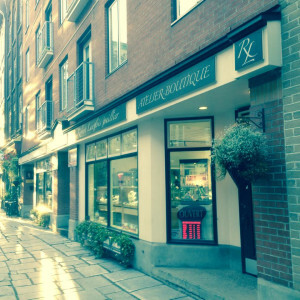 The Robert Langlois’s Workshop-Boutique goes above and beyond simply making jewelry by offering you the possibility of being in contact with other Quebec creators and a network of jewelers giving you access to the most complete services.